Four years ago I had never heard of Jini Dellaccio. This week, I walked through crowds that I would normally associate with rock concerts and passed fans of all ages, in lines snaking around the block behind the Harvard Exit cinema, a building dating back to 1925 as a meeting hall in the eclectic and charming artsy community of Capitol Hill, Seattle. I still can’t quite believe that the growing “stand-by” queue for a few “no-shows” and last minute seats was not for a garage punk band or a glimpse of the latest hip and trendy performer, but to see the film I made about a 96 year-old “rock” photographer called Jini Dellaccio. We are all connected now by this remarkable woman, and the story of her artistry as told in “Her Aim Is True”, at our sold out world premiere screenings @SIFF2013, (Seattle International Film Festival). The cinema was filled with laughter (due to Dellaccio’s charming storytelling and sense of humor), as well as many gasps when Jini’s iconic images crossed the screen. (You could almost hear a collective audience exclamation of “Wow!” for the inventive way Dellaccio captured bands like The Sonics, The Wailers, and The Daily Flash to name a few that the audience saw peering from trees and through the misty shores of Puget Sound. Beyond cleverly casting her lens over the bands in this distinctive Pacific Northwest backdrop, many I spoke to afterwards were mesmerized by the story of this self-taught photographer who spent her middle age in this scene. They had no idea that legends like The Who, Neil Young, Mitch Ryder, Mick Jagger were among Dellaccio’s live performance shots. (These were taken early in the rock and roll concert days, and at the start of their soon to be high octane careers). 1)Jini Dellaccio raising her arms to greet the press photographers on the Red Carpet with an appreciative smile at their interest and look of wonder that they were here for her, and her work! 4) Overheard from the back of the audience, day 2: “I am completely blown away, I just want to sit here and watch it again! “ and “ Jini, you took my photo when I was a child”. 5)Live Tweets & posts popping up from the audience during the Q & As, “We need more screenings please, I want my friends to see it”, “Two hours ago I had no idea who Dellaccio is. So glad I do now” “ Jini Dellaccio is sitting behind me.” “Can’t believe she is 96 and watching the film with us”. Our SIFF audiences now join the the community that has supported my filmmaking, and given me an opportunity to pluck another piece of inspiring women’s history, along with Dellaccio’s unique experience and achievements from out of the shadows. It is hard to describe how moving it was to be in that cinema and see Jini Dellaccio, aged 96 being acknowledged by several hundred keen film goers and as the credits rolled, receiving a much deserved standing ovation for her artistry from new fans, strangers and dedicated supporters alike. Reaching more audiences with #heraimistue is the production’s next mission. 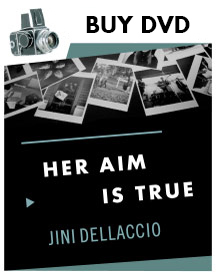 As a filmmaker I set out to capture the essence of Jini Dellaccio’s masterful artistry and engaging personality, and through showcasing some of her stunning photography, open a window to an archive and history that deserves more attention. I hope you will help us bring this story to your community soon! ← Bring Up The Audiences!